Today is Leonard Peacock’s 18th birthday. It’s also the day he has elected to kill himself – but first he has to kill his former best friend, Asher Beal. Before he can do that, though, he has some gifts to deliver, gifts he’s wrapped in pink paper and packed in his knapsack along with his grandfather’s P-38 WWII handgun. I want to give them each something to remember me by. To let them know I really cared about them and I’m sorry I couldn’t be more than I was – that I couldn’t stick around – and that what’s going to happen today isn’t their fault. 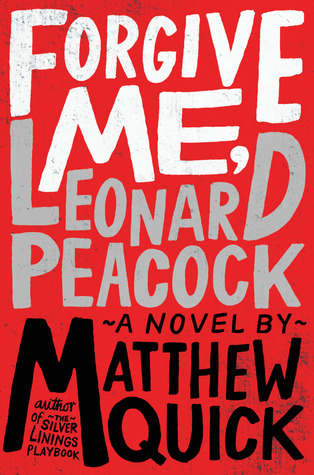 Forgive Me, Leonard Peacock is a smart, funny, heartbreaking novel by Matthew Quick, perhaps better known for Silver Linings Playbook. I was immediately enchanted by Leonard’s charming, wry and honest narrative – he is immediately believable and sympathetic. Leonard isn’t your run-of-the-mill teenager. He’s a thinker. He’s also in real emotional distress. It’s no wonder. His father, a former rock star currently on the run from the IRS, and his mother, a fashion designer who lives in NYC with her French boyfriend, are clearly terrible parents. As Leonard makes his way through his day and we meet the four people he deems worthy of parting gifts, it’s easy to see how lonely and isolated he is. First there’s Walt, the old man who lives next door. “I met Walt during a blizzard” Leonard tells us in one of the novel’s frequent (and often caustic) footnotes. Leonard’s mother, Linda, had asked him to go “shovel the driveway, even though it was still snowing, because she had to go out to meet another fake designer or some bulimic model.” Walt is an old movie aficionado and soon enough he and Leonard are quoting Bogart and Bacall back and forth at each other. Then there’s Lauren, the home-schooled Christian who hands out pamphlets at the train station. (Sometimes Leonard rides the train into the city, following random adults to see whether there is, in fact, any potential for happiness once you’re out of high school.) That’s where he first sees Lauren and he dreams of kissing her, although they can’t seem to overcome the obstacle in their way: Jesus. There have been days when Herr Silverman was the only person to look me in the eye. The only person all day long. It’s a simple thing, but simple things matter. I’m a teacher; that hit me in the gut. Leonard goes through his day, hinting at something horrible that happened between him and Asher, the something that necessitates his rash decision to end both their lives. With each gift, he half hopes someone will notice that something is wrong and, thankfully, someone does. For anyone who has ever felt ‘other’, for anyone who ever considered ending their own life, for anyone who has ever felt neglected, unseen, or desperate, Forgive Me, Leonard Peacock is the book for you. This entry was posted in Book Chat and tagged 2016, Book Review, highly recommended, mature teen, YA by Christie. Bookmark the permalink.